The last few months have seen a flurry of exciting developments in UK computer education, not least of which was the launch of the Raspberry Pi for general sale. Efforts to improve the teaching of computing in the UK go back to well before this date, and one of the most interesting of these projects is Young Rewired State. It's an exciting hack day (well, week, really) that takes place once a year. It brings together bright young coders from all around the country with host companies and mentors in order to teach them about code, open data and what it's like to work within a digital business. 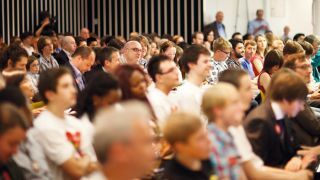 Efforts to organise Young Rewired State 2012 are starting to ramp up now, with a particular focus on finding sponsors, host companies and new 'YRSers' to get involved. With this in mind, we thought we'd speak to some of those who are involved, and who have been in the past, to find out what it's all about. We think the unique combination of open data, public spirit, code, education and socialising are tantalising, and we hope that, after reading this, you will too. What we really hope is that some of you might want to get involved, too, whether as students, mentors or hosts. Before you can understand what Young Rewired State (YRS) is, you need to know what Rewired State is, since on the website YRS is described as Rewired State's "philanthropic arm". To find out, we spoke to Emma Mulqueeny, director of both projects. She told us that: "Rewired State is a (growing) community of over 600 developers, aged 19+, and 200 developers, aged 18 and under." That network, Emma told us, grew "out of a movement of developers keen for government to open its data." This motivation means that many of the developers in the network are interested in more than just social networking - they're interested in "coding a better country", as the project's tag line reads. With a view to this end, Rewired State's main function is to organise hack days and provide mentoring programmes for programmers. Their first hack day, National Hack The Government Day, was held in 2009, and Emma tells us it was a stunning success. "In many ways," she says, "it is credited with being the spur for data.gov.uk" The database they created, by scraping government websites and begging different agencies, is linked in to Cabinet Office documents from 2009 as being the only source of open government data. That is, at least until the launch of data.gov.uk later that year. The event, which was held at The Guardian's offices, brought together 80 developers. They worked from 10am to 6pm, creating around 30 working projects that were then presented to government officials and the media. One of the projects created was a rewrite of the Active Places website, with support for disabled users and mobiles added. After just eight hours of development by only three developers, most attendees agreed that it was a substantial improvement on the original, which had cost £5million to build. Since this beginning in 2009, Rewired State has held many more hack days, and has more planned for this year. In 2011, as well as holding another National Hack The Government Day, they put on Rewired State: Parliament. Out of this event came some projects that underline the importance of open government data, and of programmers with enough interest and awareness to put it to good use. Take, for instance, Who's Lobbying. This project "reveals for the first time which groups are most often giving oral evidence to Parliament committees". Or Little Ben, a mobile application that informs users which bills are passing through Parliament, allows users to vote on them, and for their MPs to be notified of their preferences - the app even lets MPs explain their final voting decision after the event. These two projects - which facilitate a more transparent government and active citizenship - are Rewired State in a nutshell: coding a better country. Where does Young Rewired State come into things? Emma told us that, as successful as the first hack day was, "there was a distinct lack of young people at the event". So, in order to try to fix this, they arranged for a dedicated event to be held at Google's London offices: Young Rewired State. It had the same agenda - opening government data and doing cool things with it - but it was for young people only. They managed to get 50 teens, aged between 15 and 18, to come along to the event, which ran over a weekend. There was a wide range of skills; according to a blog post after the event, some were skilled developers, others were already successful entrepreneurs, while others had only a basic understanding of coding but were keen to learn more. You might think that, with such a wide range of abilities, the projects that came out of YRS would struggle to impress in the same way as those from its older sibling. You'd be wrong. What's striking about these applications is that the range of uses they put the data to is obviously orientated towards issues that affect young people. This shouldn't be a surprise, but it does show the importance of ensuring that a wide demographic of people know how to code. Each demographic has its own problems that others might not think of. If coding continues to be the preserve of the traditional geek, the interests of young people, women, the elderly, and many others, will not be represented in the technologies of the future. That first YRS was a real success. Since then, they've continued to run the event each year, but it's no longer based in one centre, and no longer takes place on a single weekend. YRS is now a distributed event. There are centres around the country, at which local businesses play host to groups of children, YRS alumni and Rewired State mentors for an entire week. They provide internet access and mentoring, helping the children to decide on their project, to develop it, and learn along the way. At the end of the week, all the centres descend on one location for a presentation day. To find out what it's like to host a YRS centre, we spoke to Harry Harrold and Rupert Redington. They run Neon Tribe, a web development agency in Norwich, Norfolk, and have been involved with YRS since the first year. We started by asking them how they came to be involved in YRS in the first place. Harry told us they'd taken on a student part-time, after he'd done his work experience with them. "Purely because he'd been working hard, and we thought he deserved a treat, and YRS seemed the sort of thing that was worth getting behind," they sent him to YRS 1 at Google. That's the 'how', but with respect to the 'why' we got two different answers from Harry and Rupert. Harry told us that they are "generally sympathetic to the idea of education being a good thing. "Rupert is an ex-teacher, and our first project in this iteration of the business was for Channel 4 Education. In fact, for a long while our home space was in public and third-sector projects, so I guess we are a sort of socially conscious organisation." There were also commercial benefits to being involved. Harry said that "We wanted Norfolk and Norwich to be mentioned among centres in parts of the country that have a track record for digital creativity - London, Manchester and Brighton. Also, it's great to be able to talk to people who might do business with you about YRS. It makes them feel a certain way about you." Rupert certainly echoed these sentiments with respect to education, and agreed that there are some very important commercial reasons for wanting to 'upskill' young people. But for him, that's secondary. What he thinks is really important is to "upskill young people about how data transparency is really important to being a good citizen. To help young people see through all the FUD [Fear, Uncertainty and Doubt]. "What I like about Rewired State, and Young Rewired State by extension, is that it takes people who have skills, but adds to it a healthy and informed disrespect for authority and an increasing ability to see through all the stuff that's out there." These were their motivations, then, so that when Mulqueeny came to them and said "We're going to make it national," Harry said that agreeing was just a natural assumption in themselves. They'd had a good experience in the first year, and the ethos of Young Rewired State spanned across so many different motivations - the decision was simple. Once they agreed to be a host, that meant opening up their office to a group of children for a week in August. Since they're a development company, and have been involved in Rewired State in the past, members of Neon Tribe's staff acted as the mentors throughout the week. How that week shapes up varies from centre to centre, but at Neon Tribe at least, it's not all coding. While talking with Harry and Rupert, they spoke to us in detail about the week in 2011, covering everything from the planning, data collection and coding right through to the final presentation. In 2011, the first day was spent thinking about people, situations they find themselves in and what kind of problems they might face in order to come up with a concrete project idea. It's the mentors' job to ensure that the group come up with some ideas that can be completed in the timeframe, and given the group's available skills. The constraints imposed by the single-week hack format, according to Rupert, are an important part of YRS. "Because we constantly have easy access to complex, well-executed programs, often people decide that for their first code project they're going to build something like World of Warcraft. It's very difficult to imagine the point of making a simple text adventure game. "The nice thing about the short timeframe is that it's clear that you can't do that, but there's still a real project that matters to work on, and there's still a pressure to deliver." In 2011, it wasn't clear whether any suitable ideas were going to come from straight conversation, so the mentors turned to the day's newspapers. Harry said: "We kept reading them until somebody said 'Norfolk wins $30m to help Broadband speeds,' at which point everyone perked up. "The children lived in rural areas, and their biggest problem was that their broadband speed was rubbish. This instantly gave us people - them - in a situation, with a problem - trying to learn to program with rubbish broadband speeds." In terms of engaging the children, and providing a concrete project that they could do something with, this seemed like the perfect idea. With a topic decided upon, the next task was to find some data to use. Knowing what data was out there would help shape their project, making it clear what directions were open to them along this route. The data that they found came from the broadband speed check websites and Ofcom. This was a really interesting part of the experience, according to Rupert. "We [as a team] thought that living in rural Norfolk gives you problems with your broadband speed, and they [the children] looked at government data that says there's no problem with broadband speeds in Norfolk. "Ofcom's public release data tends to average speeds across the region," and at this very broad level, the data just didn't match the children's experiences. So they went out to find alternative data sets that would either corroborate their experiences or the government data, and when they found some data localised to postcode level, they found there were problems with broadband speeds. This is the kind of "healthy disrespect for authority" and data literacy that Rupert was talking about. Through this experience, the young people learned that government data can't always be taken at face value, and if it doesn't match your experiences, it's worth investigating further to see what's going on behind the scenes. At this point, the group had an issue and data to program around, leaving them with the question of what to do with it. Their initial thoughts were to plot this information on a Google map - a popular data mash-up that's a powerful way to highlight geographical inequalities. Technically, it's not the most difficult thing to do, but it would present some worthwhile challenges to the students: they'd have to learn about APIs, how to put one to use, and how to source and manipulate data to make it work within the APIs' limitations. But, before they got deep in to that, they found themselves sidetracked by a conversation about what else they like to do with their computers. One of the students mentioned that he likes to play Minecraft, the enormously popular game (or 'way of life', as our own Mike Saunders would have it), in which you inhabit a world made up of blocks which you can combine to create almost anything - including entire countries, continents and worlds. So, the idea came about that they should present this data on a Minecraft map. Obviously, given Minecraft's popularity, a recreation of the UK complete with broadband speeds super-imposed on it would get a lot more attention in this format than it would as just another Google Map mash-up. It's also a far more challenging project, as Harry told us: "Firstly, you've got to build a Minecraft map of the UK. But that doesn't get you the data, so then you've got to work out a way of placing stuff on a Minecraft map programatically, and you've got to work out a way to translate your data into Minecraft data. "Of course," Harry said, "Once you've done that you might as well install an extension that will let you fly around the map of the UK" - just for the extra factor, apparently. The result? A map of the UK, which you can fly around, with every postcode district covered by a tower. The height of the tower represents the speed of the broadband in that postcode area, and once you get past a certain height, there's a light on top of the tower. That's an area with decent broadband. It's fair to say Harry and the other mentors were impressed and excited by this idea: "It's the intersection of some seriously powerful memeage: you've got Minecraft colliding with open data - absolute sodding genius." The remaining time that week was spent learning how on earth Minecraft worked - something the students knew more about than the mentors to begin with - and scrambling together the code to make it all work. After all the hacking's finished (well, at least working! ), all that's left of the YRS week is to go to the national meet-up, where all the centres come together and the students present their final work. According to Harry and Rupert, this presentation day is as important, if not more so, than any other aspect of YRS. Harry told us: "For young people who are stereotypically geeky, for people like that to be given a place in the spotlight - this is your moment to shine in the subject area that you love. That doesn't happen very often to geeks - sports, music, theatre is where that happens; not maths, science etc." Even something as basic as illustrating to these young people that the skillset they have is valuable - all of these people in suits are here to see what you have to say - and even just to show them that they're not alone is valuable." Of course, having the spotlight turned on you like this can be intimidating. Without proper support and encouragement, it's something that can go wrong. Rupert was quick to emphasise, however, that "the presentation is a completely supportive environment - even though it's not constructed as such. Nobody's going through great efforts to support each other, but are supporting each other simply because there's a shared endeavour. It feels like everyone is together." "Lots of people nodded, because nobody believes their broadband is fast enough," said Harry. Then they started talking about maps, and people nodded some more: "They all thought they knew where this was going: 'oh, they put some data on maps, that's nice,' but then the reveal… they said 'you get a map a bit like this' and then they were flying through the UK with broadband towers. Somebody beside me whispered 'That's Minecraft!'. It was a very exciting moment." That's how YRS 2011 ended, but we didn't want to end this article without getting the students' POV. After all, YRS is really all about the students. Harry put us in touch with Milo Mordaunt, one of the students involved in the 2011 Minecraft project. He told us that he got in to computers after being introduced to Linux by the team at Neon Tribe (his mum works there) - he'd seen the Compiz spinning cube on their computers and wanted it, so they installed Ubuntu on his PC and got him set up. He says that he was "obsessed with hacking/tweaking that thing… Compiz has done some serious good - I was obsessed with hacking/tweaking that thing and now I'm an LXF subscriber and Arch Linux tinkerer, all because of some spinny cube!" When we asked him about YRS specifically, he told us that it's "great for bringing like-minded people together, because there's so few in this niche field (comparatively)." Following YRS, he believes his skills are "a lot more useful now" and that he has "a lot more drive to learn, having seen other people my age developing apps and web pages!" As for the final presentation day, Milo said: "They were the best bit! Really amazing kids just standing up and talking about some project that they, you know, just casually cooked up in a week. Actual meaningful projects as well!" Once everything was done and dusted, the students, mentors and businesses all went their separate ways. But that didn't mean the end of the friendships and networks that they had developed during the week. Most of the networks are maintained through Twitter, but with mentors offering advice when their former students ask for it, and many of the students discussing ideas and continuing to support each other. Milo says that he came up with an idea, "not too long ago, about a sort of social network for ideas, and I got a lot of support on Twitter from random people at YRS."